The Tribute in Light creates two blazing columns of light where the twin towers of the World Trade Center once stood. The iconic towers were destroyed after being struck by hijacked passenger planes on Sept. 11, 2001, killing 2,753 people. The memorial is powered by 88 powerful spotlights whose beams reach six kilometres into the sky and can be viewed from as far as 100 kilometres away. It's lit from dusk to dawn — though not always continuously — every Sept. 11 in memory of those who died in the attacks. But mid-September is often when many songbirds make the long, exhausting flight from their breeding grounds, largely in Canada's boreal forests, to their winter homes in the southern U.S., Mexico, and Central and South America. They fly mostly at night, and because they've evolved to navigate with the help of the stars, they're attracted to artificial light. Such lights can lead them to collide with buildings and other human-built structures; it's in North America after cats. The Tribute in Light is an extreme example of such lights — but birds are irresistibly attracted to the bright memorial. Video recorded on Sept. 11, 2010, shows a flurry of what look like hundreds of insects circling aimlessly through the light beams. But they're birds, mostly warblers, said Kyle Horton, who witnessed the phenomenon first-hand last year. "There's this sound element to this as well, of thousands of birds calling … and it sounds like an insect chorus," said Horton, a postdoctoral researcher at the Cornell Lab of Ornithology in Ithaca, N.Y. Birds make that type of call when they're disoriented, he said. Horton and colleagues in the U.S. and the U.K. measured the effect using radar — the kind used to track storms and other weather — and published the results. Horton also spoke about the study at the North American Congress for Conservation Biology in Toronto this past summer. "Using the radar data is quite remarkable — to actually quantify it — because the scope of the attraction is beyond what we visually can see," said Horton in an interview following his talk. There were typically about 500 birds within half a kilometre of the Tribute in Light memorial when it wasn't lit, Horton found. But within 20 minutes of the beams switching on, the number of birds skyrocketed to nearly 16,000. "There's almost this magnetic pull of birds to these lights," he said. Horton and his colleagues estimate 1.1 million migrating birds were impacted by the Tribute in Light in a seven-year period between 2008 and 2016. 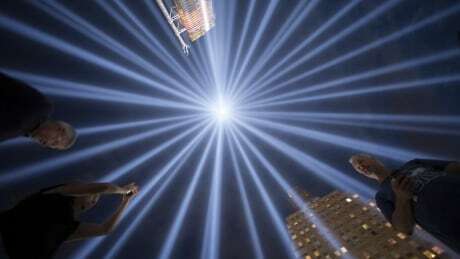 That's despite the fact that since 2009, the lights are shut off for 20 minutes whenever volunteers count more than 1,000 birds in the beams — under an agreement between the local conservation group New York City Audubon and the National September 11 Memorial and Museum, which runs the installation. "The worst-case scenario is that there are birds that collide with buildings, or the light directly results in the mortality of birds," Horton said. The researchers think that's relatively rare. But even if the birds aren't killed directly, the lights can still have a negative impact, Horton said. "There's no doubt that the birds are expending unnecessary energy by circling and calling in these lights," he said. That's at a time when the migrating birds need to save some energy for the thousands of kilometres they have left to fly. Shutting the lights off temporarily appears to allow the birds to find their bearings and continue southward. And Horton said it's encouraging that the people of New York City are willing to temporarily douse the lights for the birds. Michael Mesure, executive director and co-founder of FLAP Canada, a Toronto-based group that aims to reduce bird collisions with human-built structures, agrees that's great. "But the fact is that we shouldn't be attracting them in the first place," he said. FLAP worked with the New York City Audubon to try to convince New York authorities not to build the light monument, Mesure said, but the groups were unsuccessful. FLAP had anticipated a problem after previous experiences with migrating birds at structures like the CN Tower, which used to be lit up by intense floodlights. After FLAP showed that it was drawing in hundreds of birds each spring and fall, the CN Tower agreed to shut off the lights during migration season. "The problem virtually disappeared at that particular structure," Mesure said. The CN Tower's floodlights have since been replaced by dimmer, colour-changing LEDs that don't attract birds in the same way. Mesure thinks more could be done to minimize the impact of the Tribute in Light. "I get it, it's an anniversary date," he said. "But find either another way to celebrate or have that tribute at a different time of year to avoid this issue from happening." On the other hand, both Mesure and Horton say the Tribute in Light is only a small contribution to the much bigger problem of urban lights on migrating birds. Horton's radar research also shows birds fly disproportionately through cities. It's not just because they're attracted to the lights, Mesure says, but also because many of North America's biggest cities are located in traditional migration corridors, and along lakes and other shorelines that birds use for navigation. That means cities need to do their best to reduce the impact of artificial lights on migrating birds, he said. "Any light at night at the wrong place, at the wrong time can be lethal to a bird," Mesure said. But bird deaths are highly preventable, he added. "You'll never find a problem as easy as this — you flip a switch and the problem disappears."